There was something really special about this dish. It was really restaurant quality. It may have been the richness of the sauce, cooking the shrimp in butter…the combination?! It was really very good. To Make the Sauce: place tomatoes, garlic and chiles in a medium saucepan, cover with water. Place over medium-high heat and simmer for 10 minutes, until tomatoes are cooked through and soft. Rinse and dry saucepan, pour a tablespoon of oil and place over medium heat. Once hot, pour pureed tomato sauce and cover partially with a lid. Let it simmer for about 10 minutes, stirring occasionally, until it thickens, and deepens its color to a much darker red. Remove lid, reduce heat to medium-low and add creme fraiche. Stir and keep at a steady low simmer for about 8 to 10 more minutes, until it coats the back of a wooden spoon. To Heat the Tortillas: Heat them on an already hot comal or skillet set over medium-low heat, for a minute or so per side, until tortillas have lightly browned. Alternatively, “pass them through hot oil”: heat enough oil to reach 1/2-inch deep in a medium sauté pan, over medium heat until hot. Gently glide each tortilla through the oil, for about 10 to 15 seconds on each side, so they completely heat through, lightly fluff and change color. Transfer the tortillas to a paper towel-covered plate. Alternatively, place on a microwave safe-plate or tortilla warmer with lid. Cover with a damp paper towel and either a lid or plastic wrap. Microwave on high for 1 minute. Keep warm. To Make the Filling: Heat one tablespoon of the oil and one tablespoon of the butter in a large skillet set over high heat. Once very hot but not smoking, add the shrimp and the remaining 1/2 teaspoon salt. Cook for a couple minutes, stirring a few times. The shrimp should be cooked, a bit browned but crisp and plump on the inside. Remove with a slotted spoon and place in the bowl. Mix with the diced avocado. To Assemble the Enchiladas: One by one glide each prepared tortilla through the sauce. Place on a plate, spoon about 3 tablespoons of the shrimp and avocado mixture in the middle and fold as in a quesadilla. Place on individual plates or a platter and continue with rest of the tortillas, laying each one gently on top of the edge of the other. Once you are done, generously spoon more of the tomato sauce on top. Garnish with chives and crumbled cheese. I’m going to make these Josette. Sounds absolutely delicious. Very interesting assembly process. No baking required, just fold and serve. And the sauce! Yum! Oh my gosh, I forgot to email you to let you know we did try it and loved them! I made them Tuesday evening and what a hit. The sauce was incredible and I kept eating it by the spoonfuls. I don’t really buy shrimp too often so it was nice to have something new to do with them. I only used one jalapeño and it was spicy enough. And rather than large shrimp I bought the little “mini” ones because they were fresh. I’ll be making this often for sure. And I’ll make sure to use the large shrimp next time. Thank you! Yay!! You just made my day! 🙂 So happy to hear that you enjoyed them too! I just love Mexican food. These enchiladas look so good! That’s criminal! I’d rather have to work on 4th of July!! 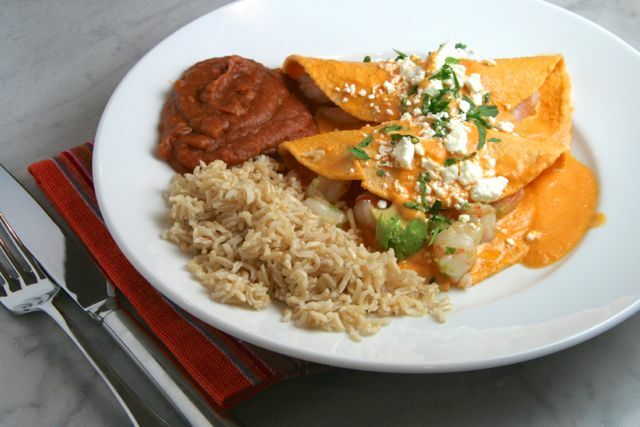 great looking enchiladas! Josette, Shrimp enchiladas sound so good! I should try them! These sound delicious! Easy but some delicious flavors.